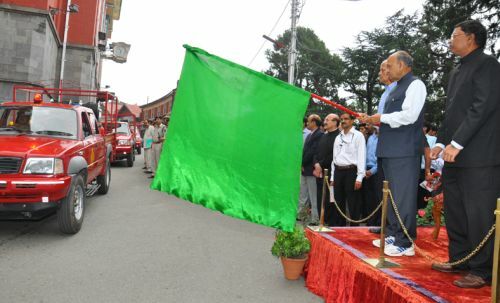 Chief Minister Prem Kumar Dhumal flagged off a fleet of five quick fire response vehicles for the districts of Shimla, Hamirpur, Mandi, Kullu and Sirmour, from CTO Chowk here today and released ‘Do’s and Don’ts’ in the event of various disasters and firemen ‘Prayer’ publications to mark the launching ceremony. Speaking on the occasion, Chief Minister said that 20 more quick response vehicles would be added to the existing fleet of 38 vehicles by spending Rs. 2.33 crore over the same thereby increasing the fleet strength to 58 in the State during the current financial year. He said that modernization of the fire services was in progress in the State and state of the art fire machinery and tenders were being made available to the department to deal with any emergent case within their jurisdiction. He said that all out efforts were being made to protect the life and property of the people of the State from fire accidents by making emergency services available to the people round the clock. He said that in the new quick response vehicles advance fire technology back pack with 9 litres capacity had been installed to facilitate the firemen to carry the extinguishers to narrow lanes in the event of fire. He said that additionally one CO2 extinguisher had also been installed in the vehicle which had unique feature of carrying a rescue team consisting of five members. 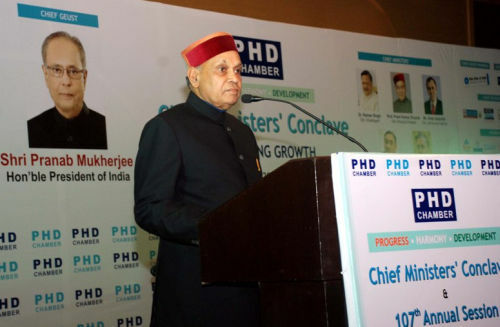 Prof. Dhumal congratulated the Fire Services Department for incorporating innovative fire fighting equipments to deal with any type of disastrous moments. He said that all out effort would be made to update the department and equip the firemen with latest techniques in fire fighting. Earlier Additional Director General of Police and Chief Fire Officer B.Kamal Kumar welcomed the Chief Minister and detailed various activities of the department. Demonstration of the back pack fire fighting was also given by the firemen on the occasion. Suresh Bhardwaj, Dr. Director General of Police D.S.Manhas, S.R.Mardi, K.C.Sadyal, Additional Director Generals of Police, S.R. Sharma, Inspector General of Police, A.N.Sharma, Commissioner, Municipal Corporation, Onkar Sharma, Deputy Commissioner and other prominent people of the town and senior officers were present at the occasion.